For the second time in three seasons, Calgary Flames general manager Brad Treliving came into the annual NHL Draft coming off a playoff appearance by his club. For the second time in three seasons, he made a big move at the draft to upgrade his team’s blueline group in an effort to keep them in the playoffs a little bit longer next time. In-between his trade talks, his club also made five selections in the draft. Here’s a look at how the Flames did on draft weekend in Chicago. The Flames selected 16th in the first round, their latest opening round selection since 2009 – a product of their newfound on-ice success (and the NHL adding another team). With a few interesting names on the board, the Flames went fairly local by selecting Juuso Valimaki of the Western Hockey League’s Tri-City Americans. A second-year Finnish defensemen playing in the WHL as an import, Valimaki has become a huge offensive contributor for the Americans and scored at just under a point-per-game pace this past season. 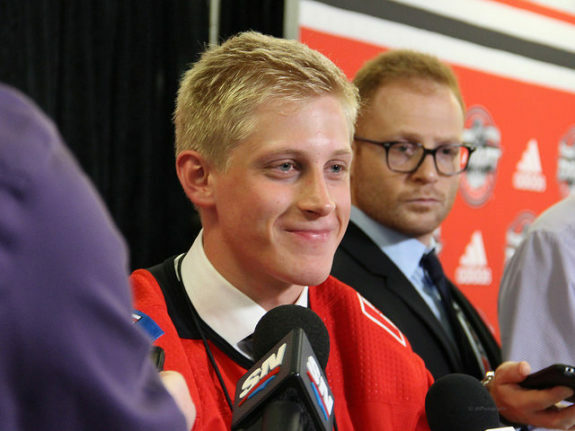 After his selection Valimaki noted he wants to improve his skating; the comment prompted Treliving to chuckle when it was relayed to him, as the Flames feel his skating is good and would rather he work on his patience in the defensive zone. The second day of the draft was to begin with the Flames sitting idly for two rounds, a product of a pair of trade deadline deals that saw them swap their second and third round picks for Curtis Lazar and Michael Stone. Instead, the Flames made arguably the biggest splash of the weekend by trading a trio of early future picks to the New York Islanders for defenseman Travis Hamonic. The cost of the picks is a bit hefty, but Hamonic slots right into a defensive group that already boasts Mark Giordano, T.J. Brodie and Dougie Hamilton. 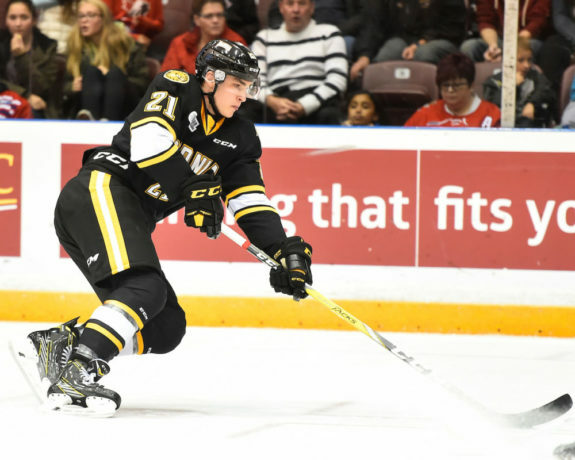 As the pieces for the Hamonic deal were being confirmed on the draft floor, the Flames made the fourth round selection as they took Sarnia Sting center Adam Ruzicka. An import from Slovakia, he admittedly struggled with the pace of the OHL at first but had a strong second half of the season. He’ll need to be more consistent in the future, but he is said to have excellent offensive abilities. In the fifth round, the Flames went to a familiar place: the WHL. They grabbed Medicine Hat Tigers forward Matt Fischer, who was available in his third NHL Draft. An agitating forward that was in and out of the Tigers lineup during his first two seasons, he seemed to find his offensive game and was a point-per-game player on Medicine Hat’s top offensive line last season. He’s able to play pro next season or return to the WHL as an overage player. In the sixth round, the Flames went to an unfamiliar place. They selected a QMJHL player for the first time since 2014 (and for the first time since 2013 for a skater) as they grabbed lanky right wing D’Artagnan Joly of the Baie-Comeau Drakkar. The youngest of seven hockey-playing brothers, including three that played professionally, Joly was offensively potent but struggled with consistency as a second-year player in the Q. With their final selection, the Flames selected junior forward Filip Sveningsson from HV71 in Sweden. As with the other players selected by the organization, Sveningsson is touted as talented but needing to bring his offensive game on a consistent basis. As a younger Swede who hasn’t consistently played pro hockey yet, he’s a bit more of a longer-term project for the club. The Flames didn’t do anything terribly surprising over the draft weekend, either via their selections or their big trade, but their moves were prudent, measured and confident. The club stuck primarily to familiar sources with their selections – Sweden and the WHL – and after a couple seasons of accumulating defensive assets, they leaned towards forwards with high offensive ceilings rather than playing it safe with a more conservative draft strategy. Valimaki’s a nice complement to a defensive prospect group that includes college standout Adam Fox and AHLers Oliver Kylington and Rasmus Andersson. The big-bodied offensive talents of Ruzicka and Joly slot in nicely alongside recent Flames picks such as Matthew Phillips, Dillon Dube and Andrew Mangiapane, all somewhat undersized but more consistent scorers. The Hamonic deal would be considered surprising if it wasn’t a logical extension of what Treliving has been attempting to do since he arrived in Calgary: turn the club into a contender by shoring up its defensive group with big additions. 2015’s draft saw Hamilton added via trade and the Hamonic transaction had several similarities, and both of them set up the Flames nicely for the immediate future.